Farewell Annette, we'll miss your smiling face red cheeks and laughter at lunch. I love the new stamp set Vintage Vogue from Stampin' Up, even better they are now available for clear blocks. There is much debate wood mount vs clear mount, I have no preference other than the containers are much smaller and the stamps are cheaper. I have been using clear mount stamps for awhile now and love the quality so rubber of clear mount either is great by me. I made this card for Annette one of my staff who is leaving her last day is Friday and I am going to miss her very much. She is a fantastic person who works very hard both at her job and her family. She never complains, and is devoted to her two boys and her husband. I will miss her as will the rest of our group, she was a vital part of our team and it will not be the same without her. Thank you Annette for all your hard work over the past few years, you are truly a good friend. 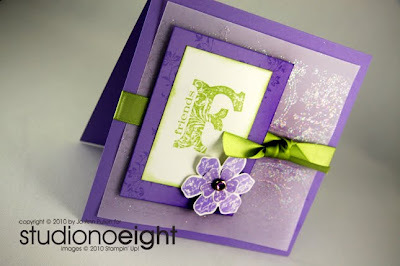 For this card I used the Vintage Vogue set along with the jumbo Very Vintage all of which are in the NEW Occasions Mini Catalogue. This is gorgeous, and by far the nicest card I've seen made with this set. you rock!! 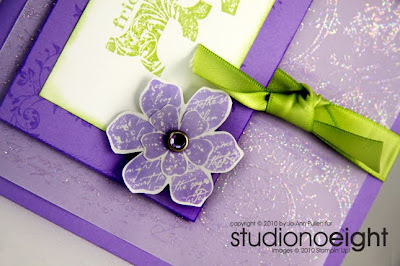 So pretty - I love this colour combo!